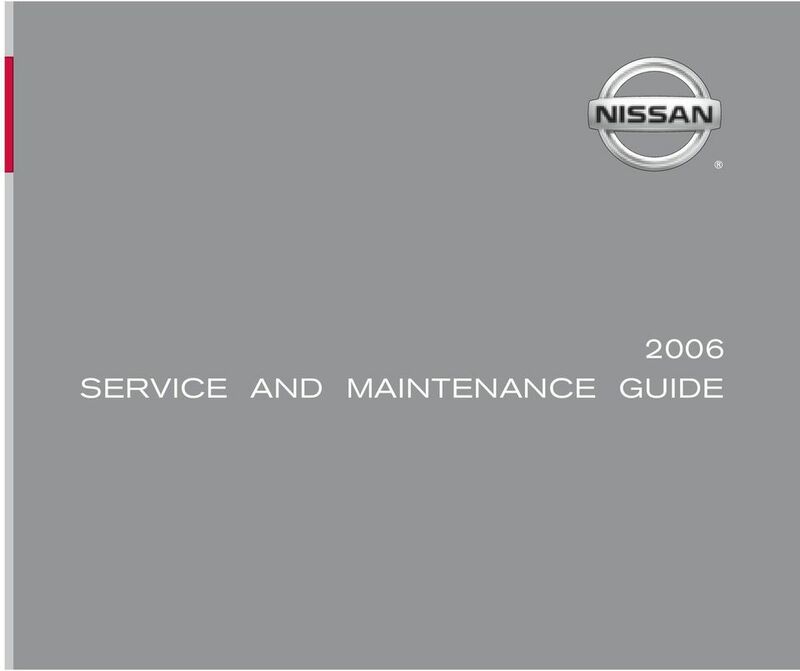 Download "2006 SERVICE AND MAINTENANCE GUIDE"
6 WHY NISSAN SERVICE? * GENUINE SERVICE 4 To safeguard the quality, reliability and safety of your vehicle, an authorized Nissan dealer is recommended for maintenance or repair. Only an authorized Nissan dealer offers you these advantages: Nissan trained and ASE certified technicians Immediate access to warranty service history and Nissan technical information Latest diagnostic, special tools and service techniques Genuine Nissan Parts that meet Nissan s demanding standards 12 month/12,000 mile parts and labor limited warranty when Genuine Nissan Parts are installed by your dealer Lifetime limited warranty on select replacement parts Clear, up-front estimates Time guaranteed Express Services (at participating dealers) For All Your Service Needs Over 1,000 locations nationwide Shuttle service/courtesy van (at participating dealers) Your Nissan dealer is a full-service maintenance and repair center. We recommend using authorized Nissan Service and Genuine Nissan Parts that we have designed for their reliability, safety and suitability for your Nissan vehicle. We are committed to providing you with quick, efficient and competitively priced service and parts. * May differ or not apply outside the United States, please inquire of your dealer. 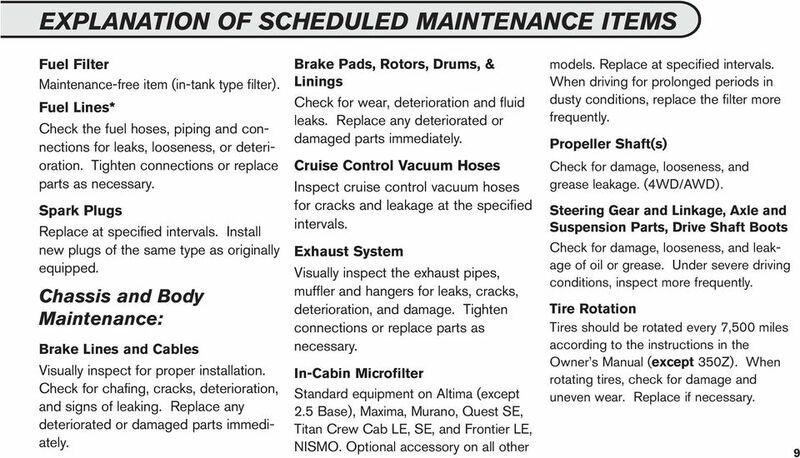 10 EXPLANATION OF SCHEDULED MAINTENANCE ITEMS 8 The following descriptions are provided to give you a better understanding of the scheduled maintenance items that should be regularly checked or replaced. 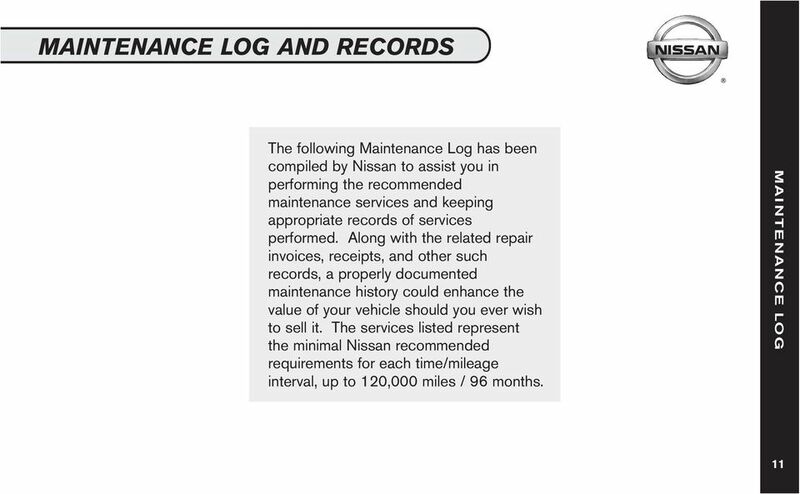 The maintenance log indicates at which mileage/time intervals each item requires service. 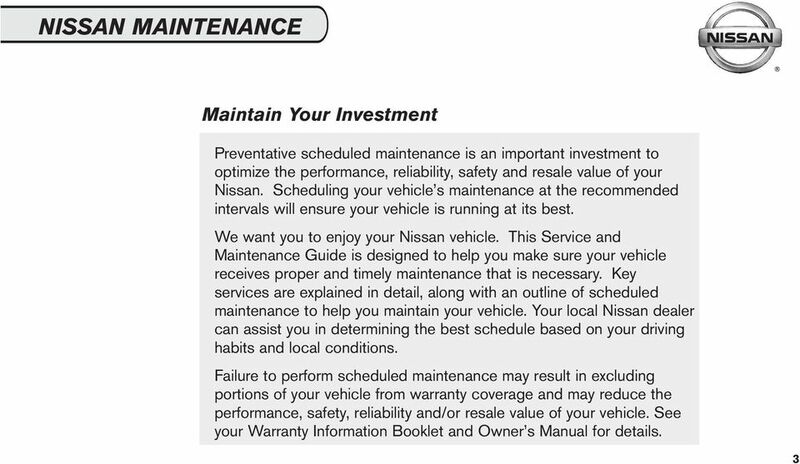 In addition to scheduled maintenance, your Nissan requires that some items be checked during normal day-to-day operation. You can find these items listed under General Maintenance in Chapter 8 of your Owner s Manual. 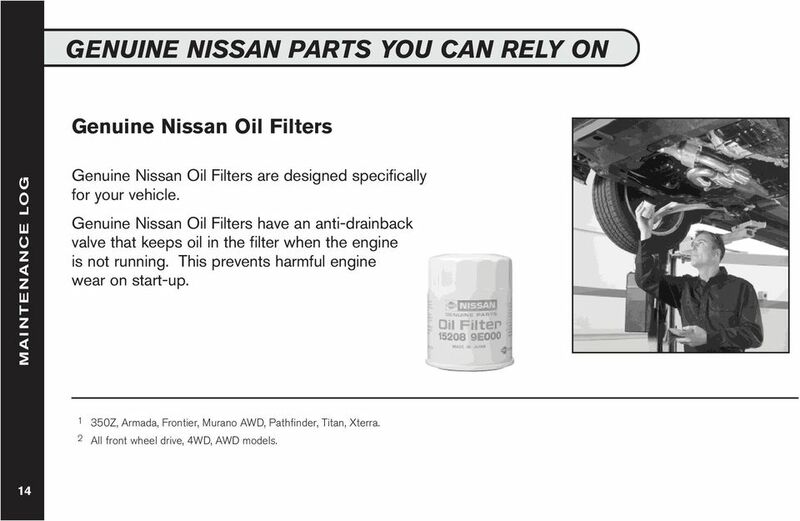 Items marked with * are recommended by Nissan for reliable vehicle operation. 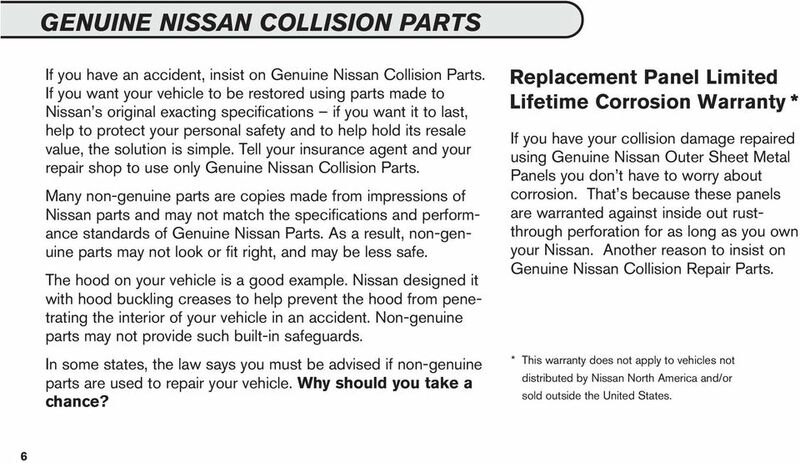 You are not required to perform maintenance on these items in order to maintain the warranties which come with your Nissan. Other maintenance items and intervals are required. 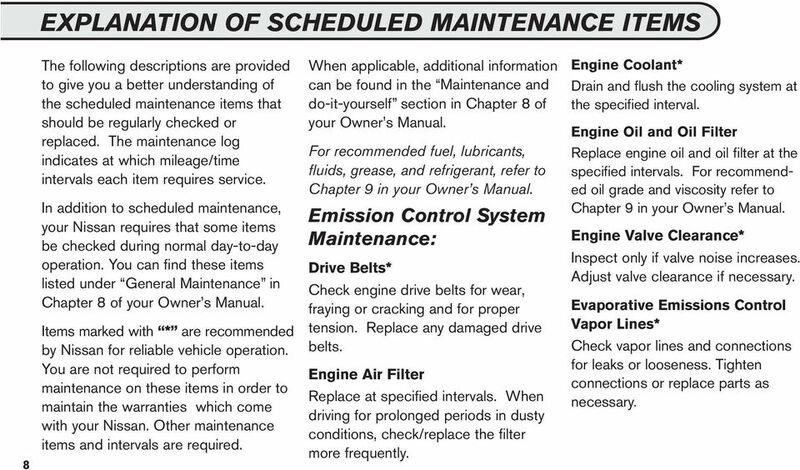 When applicable, additional information can be found in the Maintenance and do-it-yourself section in Chapter 8 of your Owner s Manual. 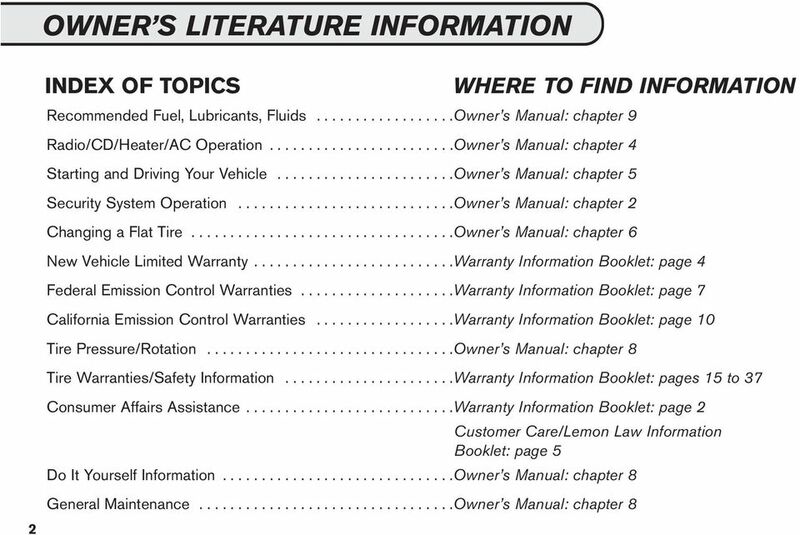 For recommended fuel, lubricants, fluids, grease, and refrigerant, refer to Chapter 9 in your Owner s Manual. Emission Control System Maintenance: Drive Belts* Check engine drive belts for wear, fraying or cracking and for proper tension. Replace any damaged drive belts. Engine Air Filter Replace at specified intervals. 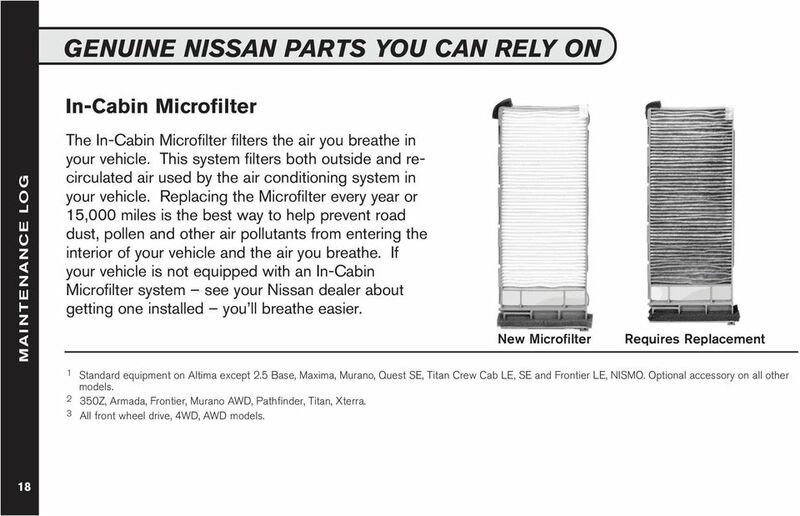 When driving for prolonged periods in dusty conditions, check/replace the filter more frequently. Engine Coolant* Drain and flush the cooling system at the specified interval. Engine Oil and Oil Filter Replace engine oil and oil filter at the specified intervals. 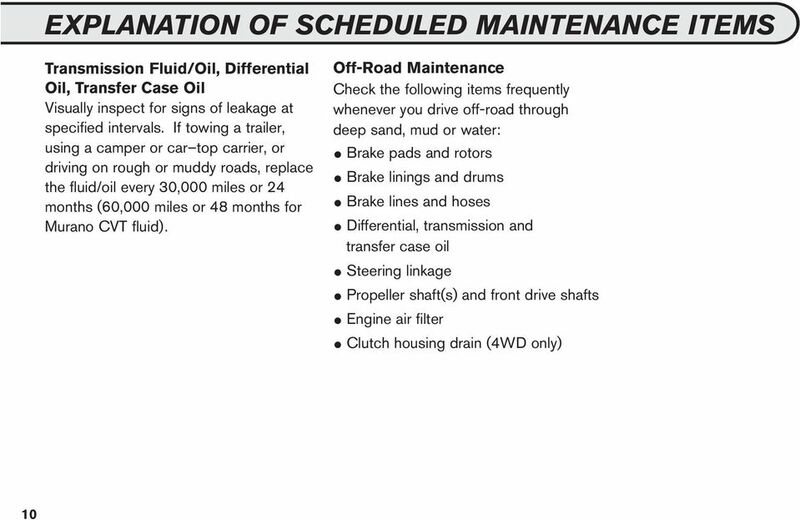 For recommended oil grade and viscosity refer to Chapter 9 in your Owner s Manual. Engine Valve Clearance* Inspect only if valve noise increases. Adjust valve clearance if necessary. Evaporative Emissions Control Vapor Lines* Check vapor lines and connections for leaks or looseness. Tighten connections or replace parts as necessary. 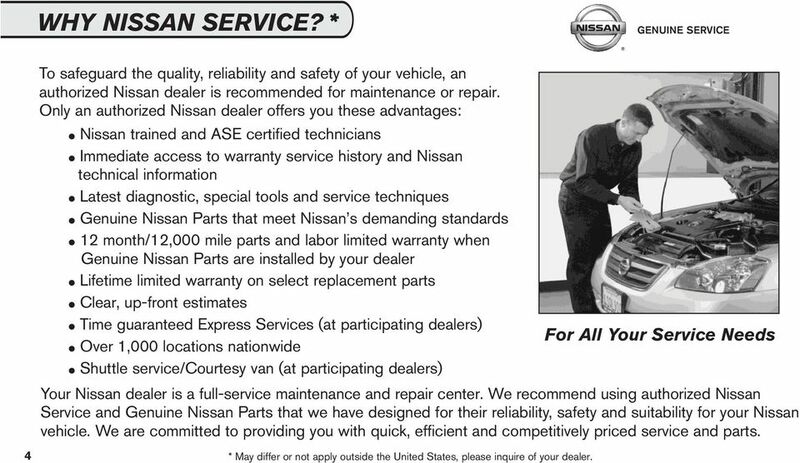 14 NISSAN EXPRESS SERVICES * Many Nissan dealers nationwide now offer Express Services. All Express Services include a 14-point vehicle inspection and the Express Service guarantee the Service is completed in the allotted time or your next Express Service 30 Oil and Filter Change is FREE. 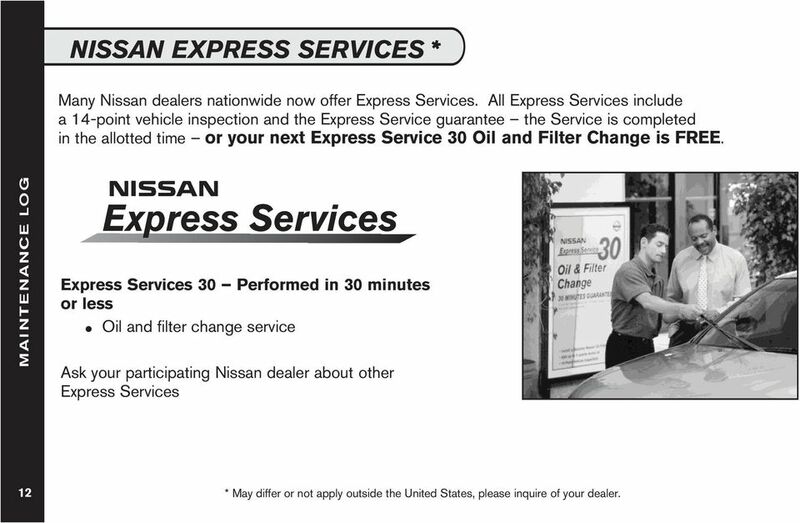 Express Services Express Services 30 Performed in 30 minutes or less Oil and filter change service Ask your participating Nissan dealer about other Express Services * May differ or not apply outside the United States, please inquire of your dealer. 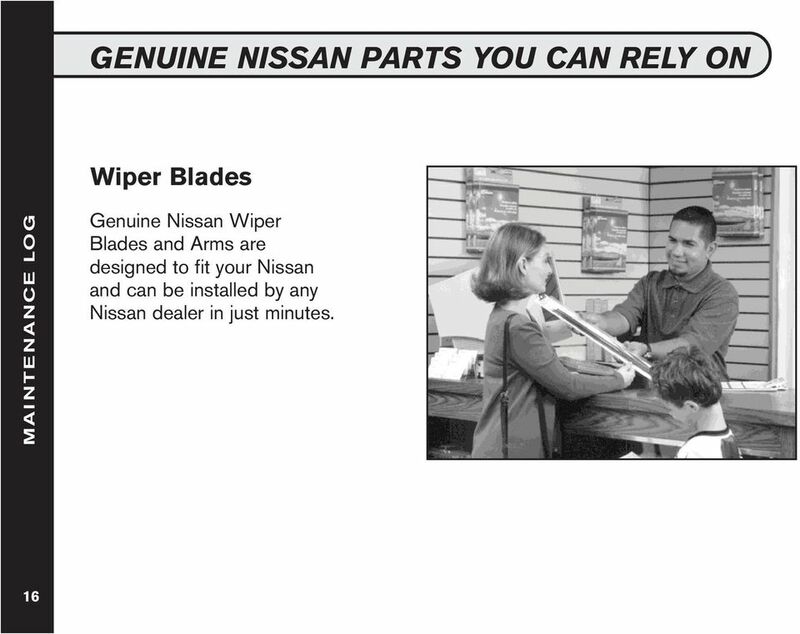 24 NISSAN SERVICES DESIGNED WITH YOU IN MIND * Brake Service Stop at Nissan for Brake Service. Install new Genuine Nissan front brake pads Inspect front rotors Inspect and adjust parking brake as necessary Inspect entire brake system: - Rear Brake Pads/Shoes - Rear Brake Rotors/Drums - Master Cylinder/Wheel Cylinders - Brake Calipers - Brake Fluid/Brake Hoses/Brake Lines - Vacuum Booster Road test your vehicle Genuine Nissan brake pads are just like the ones that came on your vehicle from the factory, and are warranted for 12 months or 12,000 miles. * May differ or not apply outside the United States, please inquire of your dealer See your participating Nissan dealer for details. 26 30,000 MILES OR 24 MONTHS Lubricate all locks/hinges Replace automatic transmission/cvt fluid Replace differential oil 1 Replace engine air filter Replace engine coolant/flush system Replace engine drive belts Replace in-cabin microfilter 2 Replace manual transmission oil Replace radiator cap Replace transfer case oil (4WD/AWD) Replace wiper blades Optional: flush automatic transmission (flush with ATF) Brake lines & cables Brake pads, rotors, drums & linings Cruise control vacuum hoses Drive shaft boots 3 Fuel lines/connections Fuel tank vapor vent system hoses Headlights/adjust if necessary SCHEDULE 1 AND 2 MAINTENANCE Replace engine air filter Replace in-cabin microfilter 2 Automatic transmission fluid 4 Brake lines & cables Brake pads, rotors, drums & linings Cruise control vacuum hoses CVT fluid (Murano) Differential oil 1,4 Drive shaft boots 3 Fuel lines/connections Fuel tank vapor vent system hoses Manual transmission oil 4 Transfer case oil (4WD/AWD) Equipment varies by model. 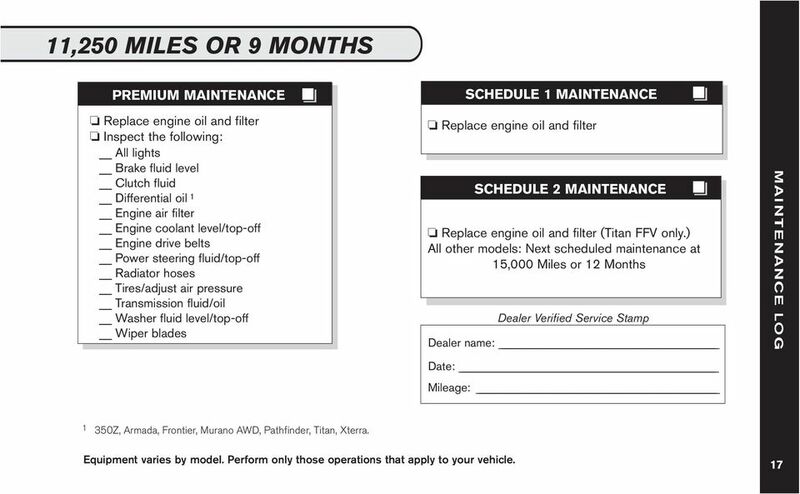 Perform only those operations that apply to your vehicle. 28 NISSAN SERVICES DESIGNED WITH YOU IN MIND * Your Nissan Dealer is Your Complete Source for Tires Original Equipment Tires and Other Major Brands Competitive Pricing Road Hazard Protection Included With Each Tire** Convenience Factory Trained Technicians Tires are an important component of your Nissan driving experience. They provide the four points of contact between your vehicle and the road and affect acceleration, braking, cornering, load-carrying capacity, and overall handling and performance. Nissan engineers perform extensive tests to help determine which tires are best suited for use on Nissan vehicles. Replacing the tires on your Nissan with those that meet the Original Equipment specifications will help maximize your vehicle s handling, comfort and safety. * May differ or not apply outside the United States, please inquire of your dealer. ** Excludes Medalist Brand See your participating Nissan dealer for details Z, Armada, Frontier, Murano AWD, Pathfinder, Titan, Xterra. 2 All front wheel drive, 4WD, AWD models. 30 41,250 MILES OR 33 MONTHS Brake fluid level Clutch fluid Differential oil 2 Engine air filter Engine coolant level/top-off Power steering fluid/top-off Radiator hoses Tires/adjust air pressure Transmission fluid/oil Washer fluid level/top-off Wiper blades SCHEDULE 1 MAINTENANCE SCHEDULE 2 MAINTENANCE (Titan FFV only.) All other models: Next scheduled maintenance at 45,000 Miles or 36 Months Standard equipment on Altima except 2.5 Base, Maxima, Murano, Quest SE, Titan Crew Cab LE, SE and Frontier LE, NISMO. Optional accessory on all other models Z, Armada, Frontier, Murano AWD, Pathfinder, Titan, Xterra. 3 All front wheel drive, 4WD, AWD models. 36 60,000 MILES OR 48 MONTHS Lubricate all locks/hinges Replace automatic transmission/cvt fluid Replace differential oil 1 Replace engine air filter Replace engine coolant/flush system Replace engine drive belts Replace in-cabin microfilter 2 Replace manual transmission oil Replace radiator cap Replace radiator hoses Replace transfer case oil (4WD/AWD) Replace wiper blades Optional: flush automatic transmission (flush with ATF) Brake lines & cables Brake pads, rotors, drums & linings Cruise control vacuum hoses Drive shaft boots 3 Fuel lines/connections Fuel tank vapor vent system hoses Headlights/adjust if necessary SCHEDULE 1 AND 2 MAINTENANCE Replace engine air filter Replace engine coolant Replace in-cabin microfilter 2 Replace manual transmission oil (Frontier only) Automatic transmission/cvt fluid 4 Brake lines & cables Cruise control vacuum hoses Differential oil 1, 4 Drive shaft boots 3 Fuel lines/connections Fuel tank vapor vent system hoses Manual transmission oil 4 Transfer case oil (4WD/AWD) Equipment varies by model. Perform only those operations that apply to your vehicle. 40 71,250 MILES OR 57 MONTHS Brake fluid level Clutch fluid Differential oil 2 Engine air filter Engine coolant level/top-off Power steering fluid/top-off Radiator hoses Tires/adjust air pressure Transmission fluid/oil Washer fluid level/top-off Wiper blades SCHEDULE 1 MAINTENANCE SCHEDULE 2 MAINTENANCE (Titan FFV only.) 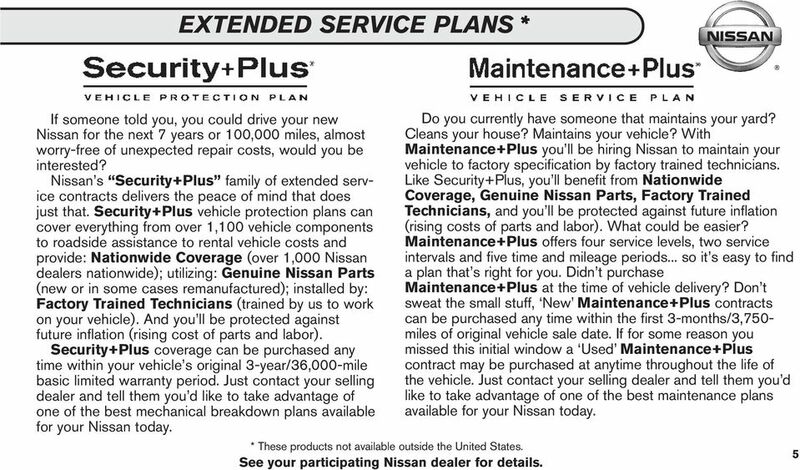 All other models: Next scheduled maintenance at 75,000 Miles or 60 Months Standard equipment on Altima except 2.5 Base, Maxima, Murano, Quest SE, Titan Crew Cab LE, SE and Frontier LE, NISMO. Optional accessory on all other models Z, Armada, Frontier, Murano AWD, Pathfinder, Titan, Xterra. 3 All front wheel drive, 4WD, AWD models. 42 78,750 MILES OR 63 MONTHS Brake fluid level Clutch fluid Differential oil 1 Engine air filter Engine coolant level/top-off Power steering fluid/top-off Radiator hoses Tires/adjust air pressure Transmission fluid/oil Washer fluid level/top-off Wiper blades SCHEDULE 1 MAINTENANCE SCHEDULE 2 MAINTENANCE (Titan FFV only.) All other models: Next scheduled maintenance at 82,500 Miles or 66 Months Z, Armada, Frontier, Murano AWD, Pathfinder, Titan, Xterra. 2 All front wheel drive, 4WD, AWD models. 44 86,250 MILES OR 69 MONTHS Brake fluid level Clutch fluid Differential oil 1 Engine air filter Engine coolant level/top-off Power steering fluid/top-off Radiator hoses Tires/adjust air pressure Transmission fluid/oil Washer fluid level/top-off Wiper blades SCHEDULE 1 MAINTENANCE SCHEDULE 2 MAINTENANCE (Titan FFV only.) All other models: Next scheduled maintenance at 90,000 Miles or 72 Months Z, Armada, Frontier, Murano AWD, Pathfinder, Titan, Xterra. 2 Standard equipment on Altima except 2.5 Base, Maxima, Murano, Quest SE, Titan Crew Cab LE, SE and Frontier LE, NISMO. Optional accessory on all other models. 3 All front wheel drive, 4WD, AWD models. 4 Replace (not just inspect) oil/fluid if towing a trailer, using a camper or a car-top carrier, or driving on rough or muddy roads. 48 101,250 MILES OR 81 MONTHS Brake fluid level Clutch fluid Differential oil 2 Engine air filter Engine coolant level/top-off Power steering fluid/top-off Radiator hoses Tires/adjust air pressure Transmission fluid/oil Washer fluid level/top-off Wiper blades SCHEDULE 1 MAINTENANCE SCHEDULE 2 MAINTENANCE (Titan FFV only.) 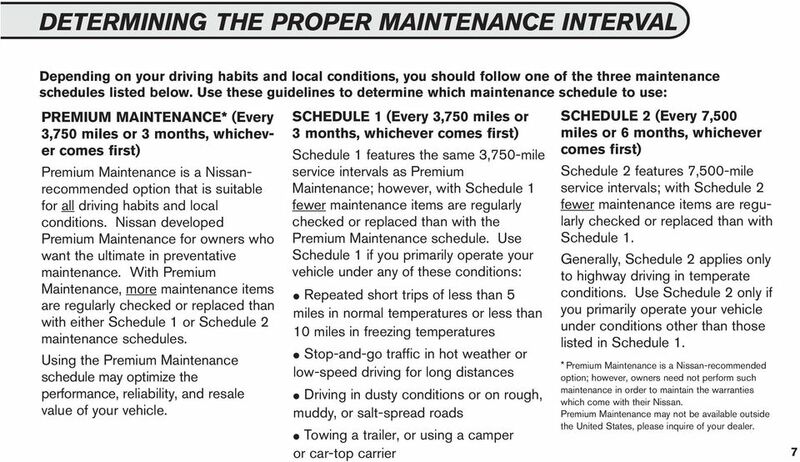 All other models: Next scheduled maintenance at 105,000 Miles or 84 Months Standard equipment on Altima except 2.5 Base, Maxima, Murano, Quest SE, Titan Crew Cab LE, SE and Frontier LE, NISMO. Optional accessory on all other models Z, Armada, Frontier, Murano AWD, Pathfinder, Titan, Xterra. 3 All front wheel drive, 4WD, AWD models. 52 116,250 MILES OR 93 MONTHS Brake fluid level Clutch fluid Differential oil 1 Engine air filter Engine coolant level/top-off Power steering fluid/top-off Radiator hoses Tires/adjust air pressure Transmission fluid/oil Washer fluid level/top-off Wiper blades SCHEDULE 1 MAINTENANCE SCHEDULE 2 MAINTENANCE (Titan FFV only.) All other models: Next scheduled maintenance at 120,000 Miles or 96 Months Z, Armada, Frontier, Murano AWD, Pathfinder, Titan, Xterra. 2 Standard equipment on Altima except 2.5 Base, Maxima, Murano, Quest SE, Titan Crew Cab LE, SE and Frontier LE, NISMO. Optional accessory on all other models. 3 All front wheel drive, 4WD, AWD models. 4 Replace (not just inspect) oil/fluid if towing a trailer, using a camper or a car-top carrier, or driving on rough or muddy roads. 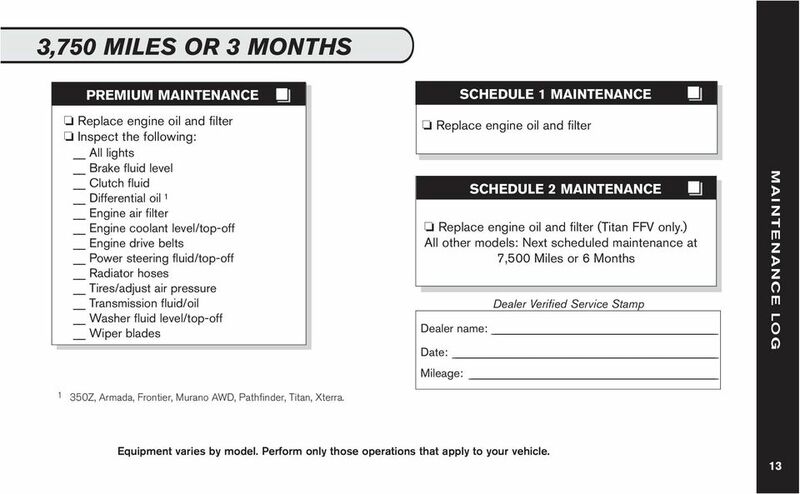 WHICH MAINTENANCE SCHEDULE SHOULD YOU FOLLOW? 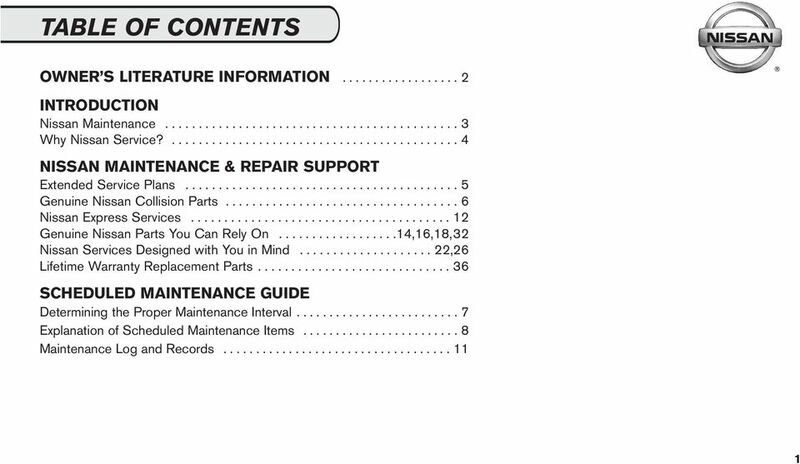 Warranty & MAINTENANCE GUIDE IT S YOUR RIDE. KNOW WHAT S UP. not to receive these offers. MINI SERvice Inclusive, MINI SERvice Inclusive plus, and mini extended warranty. peace of mind now comes in a package.
. Included. BMW Vehicle Programs bmw.ca wear & tear. Protected. Repair. Covered. peace of mind now comes in a package. bmw service inclusive, bmw service inclusive plus, and bmw extended warranty. contents. 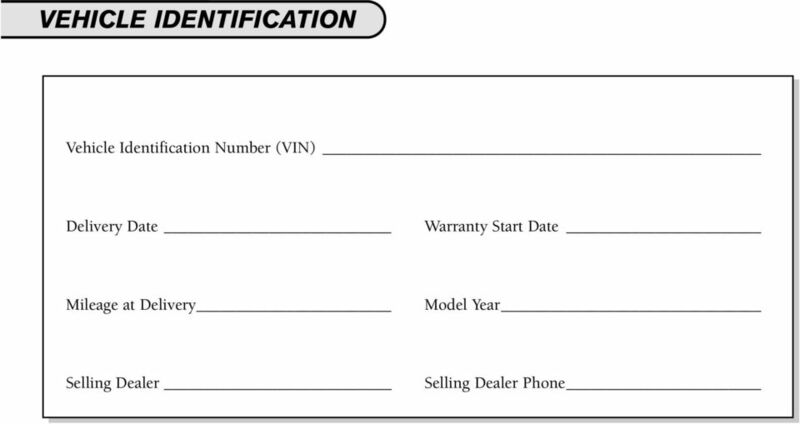 Vehicle Service Contract. Extend your coverage. Eliminate your worries. WE VE CAPPED THE PRICE. NOT THE SERVICE. Symbols. G Warning! ! Highlights hazards that may result in damage to your vehicle. BUYERS GUIDE. IMPORTANT: Spoken promises are difficult to enforce. Ask the dealer to put all promises in writing. Keep this form. YOUR DRIVING COSTS. How much are you really paying to drive? 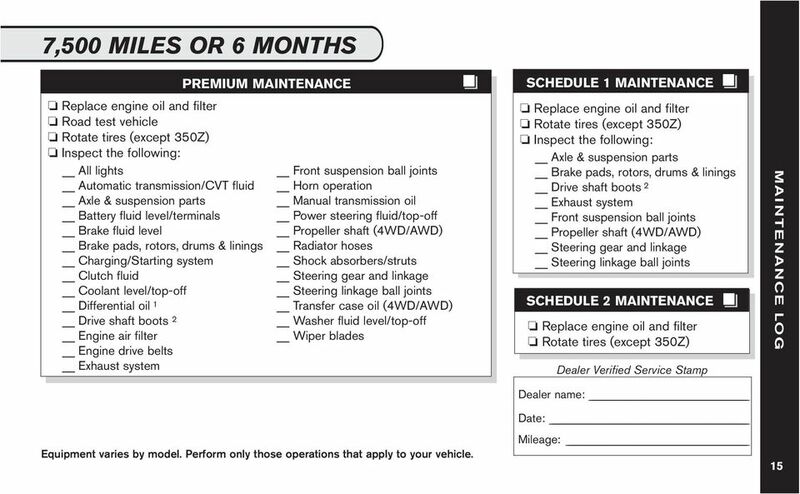 Mercedes-Benz Service Plans. Every detail revealed. Maintenance Booklet É1665844093"ËÍ 1665844093 Order no. 6515 8538 13 Part no. 166 584 40 93 Edition Edition C 2013 Welcome to the world of Mercedes-Benz We want you to enjoy your Mercedes-Benz automobile. 2012 Edition. Your Driving Costs. How much are you really paying to drive?